I don’t think that my adventurous spirit is sufficient enough to have sought to be a sailor in the era of the great sailing ships. I am awed by those sailors who would leave the safety of land to venture into the unknown of the sea with only the sky as a guide and the wind to propel them. My minimum requirements for such an adventure are engines, GPS and a satellite phone. I fully respect the courage of those sailors. They were on their own. Their entire security was within the oak timbers and cloth sails of their vessel. There was no rescue from the Coast Guard if you were washed over. Their ship was their life. I imagine that it did not take a lot of courage to sail through the doldrums. The doldrums refer to those areas of the Atlantic and Pacific Oceans affected by a low-pressure zone around the equator where the prevailing winds are very calm. (Intertropical Convergence Zone) I think that I could easily handle sailing through the doldrums. Sailing around Cape Horn is another matter. “Rounding the Cape” takes courage. Cape Horn is the sailing route around the southern tip of South America. It is notorious for being one of the most dangerous ship passages in the world. The Cape is known for fierce winds, large waves, icebergs and as a sailors’ graveyard. Sailing the Cape takes courage. Staying in the vessel is life or death when sailing the Cape. In the doldrums, the risk of getting washed over is slight. Therefore, I imagine that sailors are a bit lackadaisical in moving about the ship. The risk of getting washed over “rounding the Cape” was likely if you were to miss-step. “Holding fast” is paramount in rough seas. I like the old sailor saying of “hold fast.” A rope on board a ship is called “fast” when it is firmly secured to the vessel. To “hold fast”, is to cling to security. It is to grasp onto your life line. Death is what awaited a sailor who failed to “hold fast” in rough seas. I imagine that there have been many a sailor “holding fast” as they braved the treacherous seas of Cape Horn. Jesus gives a similar “hold fast” warning. He tells us that “If you abide in my word, you are truly my disciples.” God’s word is our line that secures us to Christ. Our security lies in Christ alone. We are to abide – remain in place – continue – dwell – endure – in His word. Abide in His word proves that we are Christ’s disciples. How are we supposed to do that? Are we abiding in His word if we never read it? Are we dwelling in His word if we never study it? How can we continue in His word if we don’t recognize it? The truth of this quote lies in Jesus’ warning to “hold fast” to his word. The act of having a Bible is similar to a sailor knowing where a secure line is on a ship while strolling the decks in the doldrums. Reading your Bible is like a sailor clinging to a ship rope while being pulled to the rails by the crashing waves and biting winds of Cape Horn. We are to “hold fast” to God’s word. We are to cling to it – abide in it – like our lives depend upon it … because they do. I guess this is one of my greatest concern for many of my professing brothers and sisters in Christ. I see very little abiding in the word – I see very few who are dwelling in God’s word – I wonder how many are “holding fast” or even know Jesus’ words. This is why I write these blogs from my own daily Bible reading. My hope is that all who read them will feel the Spirit’s tug on their hearts to wipe the dust off their own Bibles and start “holding fast” to the incredible words of our Lord and Savior. Let’s “hold fast” together; let’s encourage one another to “hold fast”; let’s out do one another in “holding fast”; let’s “hold fast” to the glory of our Lord and Savior. “There is dust enough on some of your Bibles to write ‘damnation’ with your fingers.” This made me laugh 🙂 Thank you. I may steal it for a future post! Spurgeon always had a way of saying something that made it stick. This one has always stuck with me; especially when my Bible got a little dusty. Going through some rough waters lately. Thank you for encouraging me to “hold fast” to our Lord and his love. I am sorry to hear that. I am glad that this was timely. I will be praying for you. I just want to mention I’m beginner to blogging and site-building and absolutely liked this blog site. More than likely I’m going to bookmark your website . You amazingly have wonderful posts. Thank you for sharing with us your blog site. Yes, yes, YES! Thanks for visiting my blog. It is wonderful to meet you. It is very nice to meet you also. I really like your blog. I hope you keep writing. I view holding fast similar to striving to enter rest, holding fast God’s faithfulness, for though I may be faithless, yet He remains faithful. Love in action, never failing. I am thankful that the Lord has moved you to share this blog. Amen! Very good points. I appreciate you commenting. Great Spurgeon quote! Thanks for sharing. I agree – Spurgeon just has a way with stating things. Amen! Thank you for you comment; what a great testimony to the faithfulness of our God. Truly, a much needed encouragement for these days when Biblical illiteracy runs rampant. Thank you for the link. I love you blog! I very much appreciate your daily devotions, refreshers for what we often let slide in our Christian walk. Thank you. Just a note on sailing the doldrums. The periods of calm and no wind were not times of relaxation for sailing ship mariners. There was often pressure to deliver their cargo, so the captain would lower the launch or cutter and have a crew row day and night towing the ship until the winds arrived. I can see how this can fit your message of Hold Fast. Often when our lives are most comfortable, we tend to slack off in our daily devotions. That is a very good point about the doldrums. It is not a time of rest. It should be a time of work. Thanks for you comments. Love the imagery. Thanks for all your consistency and diligence with these devotionals. You are very welcome; I am glad they are encouraging. God Bless and Sola Dei Gloria (Glory to God Alone)! 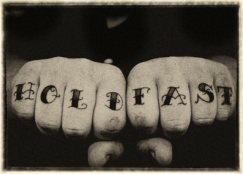 Two of your illustrations (one visual, one written) jump out at me: “Damnation” is written in dust, and “Hold Fast” is tattooed in ink. Dust, we can do something about, as long as we’ve got “hold fast” stamped on our hearts! That is awesome. I wish I would have been thinking about that when I was writing it. Thanks for commenting on your observation – I love those contrasts. Reminds me of one of my favorite tweets: ” ‘Abiding in the vine’ is an activity, not an address.” If people would internalize this, and then externalize it, the Kingdom would truly be here on earth right now. Amen and Amen! That is a wonderful truth – it is not an address. oh, and you’re pretty stinking good too. very good writing. LOL – thank you but I am in agreement that the painting does take the prize. I love that picture….man do I love it. Have never figured out how anyone makes it without clinging to Him and His Word every day! Nice post and love the pic of the ship at sea! I am in full agreement. I would find it terrifying to be adrift without our God. I think we just have to look around to see that people are not making it very well without him. It is incredible that the Lord lays on the hearts of His children the same purposes at the same time! I posted a blog today with a very similar message (the bible part). I loved yours,though. God bless you! That is very cool; thanks for commenting. What an encouragement, to know that there are other “sailors” on this journey along with me! Prayers for you today, as you journey the seas of life! Thank you for sharing!